I'm going to do a bit of backtracking here but hear me out. I may have shunned 2014's Pantone last year (yeah I'll throw that in, my way of thinking was so 2013), I may have said Radiant Orchid was nothing special and I may have truly believed it was going to result in a heap of brands jumping on a lilac purple bandwagon heading for a major crash but, I may have also been wrong in this instance. 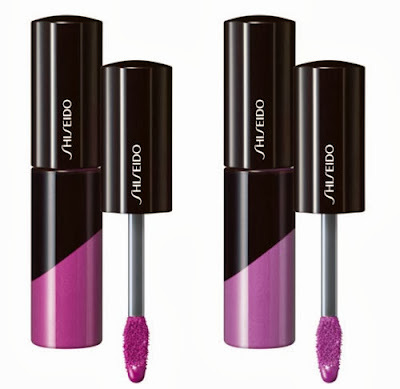 Shiseido have jumped on 'said' bandwagon (and I know they're not the only brand to do so) but they've got it oh-so right with their S/S Lacquer Gloss offerings. There's the two variations pictured above called Nebula and Phantom. Each of the lacquers uses a special formula which refines the lip texture creating a smooth base - a primer for the lips if you will; the formula then also drenches the lips in gorgeous shades of Radiant Orchid (lilac-purple) and then locks in the colour with a moisturising top coat - all in one swipe. I tend to have a weakness for purple lips, any colour of purple I'm in being honest and while the Pantone of the year on it's own wasn't hugely appealing to me I can totally see this being worn by all skin colours in any season. I really thought my love for the purple lip trend would have faded quite quickly but I'm now sure given that it's nearly a year since it started that my purple relationship is here to stay. These won't be available until March the 6th but will be available at both John Lewis and House of Fraser's once they're out. So who's with me? purple pouts all around!